This charming Noah's Ark children's quilt pattern comes with a whole zoo of creeping, crawling, flying and hooved creatures to applique your own unique quilt. This pattern is very adaptable, so you can make a variety of projects with the basic quilt pattern. With a great assortment of barnyard animals, jungle creatures, swimming and flying beasts, you can choose your child's favorite animals to applique a personalized quilt that he or she will cherish for years. If you're making a baby quilt or bed quilt, choose bright and vibrant colors and patterns for your quilt top. Back the quilt with soft, snuggly flannel for extra warmth and a soft touch. Make the quilt child-proof by using sturdy binding and double stitch the edges. 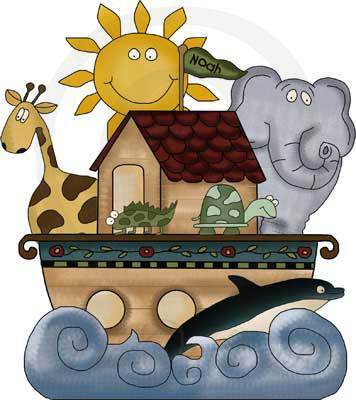 You can print out the individual animals, boat and waves in your preferred sizes to create a Noah's Ark wall hanging, baby blanket or a full-sized quilt. Use the animals individually in quilt blocks to surround the central Ark, or choose just a few characters to create simple, central motif in the center of the quilt. To print the full-size line art pattern of each image below, just click on the image.